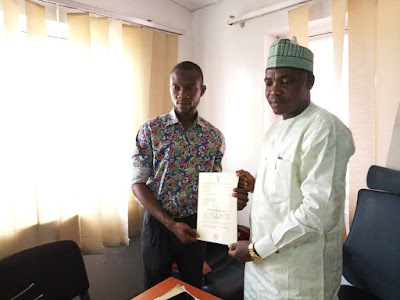 It is no more a news that the Nigerian senate President and Waziri of Ilorin Dr. Abubakar Bukola Saraki recently facilitated NIMASA appointment for three of his constituents as part of his efforts to bridge the gap created by unemployment in the State. Love him or hate, Saraki gesture is highly commendable and worthy of praises due to the fact that in this present Nigeria where merit and fairness are losing grip for whom one knows syndrome when it comes to getting one’s due in all facets of human endeavors, it takes such a powerful connection and influence of a personality like Senate President before one can be considered for employment in a highly competitive agency like Nigerian Maritime Administration and Safety Agency (NIMASA), saves providence. If we can be having much of such an opportunity, the bitter tales of unemployment/underemployment would certainly change narrative in not long time. On behalf of all constituents of Kwara Central Senatorial District, we say thank you to our representative in the red chamber and pray to Almighty Allah to reward him based on his intention. Having appreciated the gesture, I’ll like to address this part based on my conviction about the process the appointment took which gives room for much questions. Let me start this way, the three beneficiaries of Dr. Saraki NIMASA benevolence are perhaps to fill the possible vacant positions in the organisation because transparency demands that agency like NIMASA will advertise nationally if there is going to be recruitments in their organisation and if that is going to happen, more than a thousand applicants would put in for the jobs through due processes before the favoured ones be chosen. But a case why appointment letters were brought home to the beneficiaries via a politician and collected in his office, it reveals the opacity in the deal through the collaboration of the agency and the job facilitator. Therefore, Nigeria still have much to do in area of transparency because it is not every one will have privilege of knowing the Senate President. Also, the facilitator of the job himself is a strong advocate of due process and he has never abhor his feelings whenever its protocols were broken by anyone no matter how highly placed, we remember his grouse with President Jonathan on subsidy theft and presently, he is in tango with IGP for contempt against senate institution to mention but few of his advocacies for due process. 1. Which criteria were used to select the six candidates whose names were submitted for the job? 2. The Senate President office submitted six candidates for the job placement, Did he submitted the names as the only candidates that are eligible from Kwara State or based on the organization (NIMASA) request? 3. We need to ask why the three beneficiaries are from the same local government which is Ilorin West, the same local government where the facilitator hails from. Considering the fact that Senator Saraki is representing 4 LGs in his constituency, with a rough guess, we can assume that one candidate each was picked from each of Asa, Ilorin East and Ilorin South while Ilorin West got three nominees. Where is fairness in this kind of arrangement? Meanwhile, it is still assumption because it’s yet to be confirmed if the other three nominees who didn’t make it were from these remaining LGs. 4. Based on assumption that the other three who failed the tests (as SP loyalists want us to believe on the issue) were from other LGs, why was it that the three candidates from Ilorin West were the one that got the job? Was it a deliberate plan to favour SP’s LG or what? 5. The beauty of a process that produced the beneficiaries of such job supposed to be on merit and fairness without any recourse to divisive factor like political affiliation but it so bewildering that loyalty to Saraki course prevailed above these as the two of the three beneficiaries GARBA SAKA OLAWALE and ABDULRAHAMAN TUNJI ALASE are known to be staunch supporters, defenders, promoters and marketers of Saraki image, affiliation of the third person is under scrutiny. This gives leverage to conclude that the appointment is script written by Saraki political movie industry to score political point ahead of the upcoming election. 6. The loyalists to the Senate President made us believed that the job facilitation is due to his influence. What is the fate of other three slots that was recommended by the Senate President and turned down by the organization? Will he replace it back or forfeit it? 7. Is it safe to say the NIMASA offer from the Senate President is just his normal political jamboree to empower his stooges at the detriment of other Kwarans he’s representing at the National Assembly due to his failure to be transparent in the orchestration? With these above stated questions, one can conclude that loyalty is a prerequisite to other indices. It is evident that job slots suppose to be fairly distributed across board and not skewed, most especially when the man that facilitate such is a known advocate of due process and equity as he always claimed. Succinctly, apart from not following due process, the orchestration is shrouded in secrecy which makes it a mere political jamboree to gathers voter’s sympathy. Justice, Equity and Transparency should be seen in a Leader, for anyone found wanting of that shouldn’t be called a Leader.